Resveratrol is a compound found in grapes and many other plants. It is currently investigated in many skincare applications. Resveratrol protects cells from oxidative stress – it is an antioxidant itself, and activates the synthesis of other such compounds. It also regulates inflammatory responses and even aids the distribution of cosmetical sunscreens, thus helping to prevent UV damage to the skin. Similarities in structure allow resveratrol to replace estrogen in post-menopausal women, helping to reduce collagen loss and reduce skin ageing symptoms. Additionally, it counters photoageing by inhibiting melanin synthesis, resulting in lighter skin and less pigmented spots. Even acne can be alleviated by applying resveratrol, as it has antibacterial properties and controls sebaceous cell growth. Finally, it is a promising agent in melanoma prevention, able to delay the emergence and reduce the size of skin tumors. NOTE: To assist you with solubility issues, we now also sell Resveratrol in a standardized pre-dissolved solution. Just add the liquid to your cream and mix well. Resveratrol is a natural plant polyphenol, first isolated from white hellebore, but since then described in many other plant sources, including grapes and red wine. In nature, it protects plants from stress, ultraviolet light and certain fungal infections . In humans, its range of functions is even greater, with implications in anti-ageing, UV protection, cancer prevention and other areas. Large part of the research on resveratrol is focused on its antioxidative capabilities. It is known to act by two mechanisms: firstly, it directly scavenges free radicals on its own, and secondly, it stimulates the production of enzymatic antioxidants, which naturally occur at lower levels in the human body . This effect is especially important for mitochondria, which are responsible for cellular energy production and undergo higher oxidative stress. Compared with other plant antioxidants, resveratrol is very effective, with deep penetration into the skin . Surprisingly, resveratrol reduces the skin penetration of UV filters. This is desirable, since filters must act on the top layers of the skin, but resveratrol itself is able to exert the antioxidative effects across deeper layers as well . Interestingly, it was also shown to protect skin cells from cigarette smoke-induced damage, namely inflammation and oxidative shock . The most promising area of resveratrol application is cancer prevention. Combining UVA irradiation with resveratrol leads to controlled cell death, and is suggested as an alternative to surgery for skin cancer treatment . In mice, topical applications of resveratrol delayed the appearance of melanoma, as well as reduced the number and size of tumors . Similar effect was found in other studies where melanoma was induced by UV irradiation. Furthermore, post-irradiation treatment with resveratrol was found to be equally effective, indicating that it is not a simple sunscreen, but truly prevents the cancer initiation processes even after UV damage . The chemical structure of resveratrol is similar to that of human hormone estrogen, so it can activate estrogen receptors . By doing this, it reduces edema and other symptoms of inflammation after UV exposure, leading to reduced photoageing , . This makes resveratrol particularly useful for post-menopausal women – hormone replacement therapy is used to counter the skin ageing and collagen loss observed at this period in life, and resveratrol is a safe alternative to human estrogens . Resveratrol also acts as a skin whitener. It is known to inhibit the activity of tyrosinase, an enzyme necessary for melanin synthesis . This effect was confirmed in animals models, where resveratrol applications after UV exposure steadily suppressed the production of melanin and skin darkening . Whitening effects where also investigated using resveratryl triacetate, a compound that is converted into resveratrol once it is absorbed in the body. In volunteers applying this product for 8 weeks, significant lightening of the skin was observed, and the number of hyperpigmented spots was also reduced . In combination with green tea extract, resveratrol is even able to reduce facial redness, after as little as 6 weeks of treament . However, resveratrol itself is sensitive to UV exposure. It is advised to employ it in combination with other sunscreens, or use in the evening, in order to maintain its effectiveness . For example, resveratrol (at concentration of 1 %) has been used in a nighttime cosmetical blend together with 0.5 % vitamin E and baicalin. This formulation increases synthesis of collagen and other proteins, resulting in reduction of fine lines and wrinkles, less roughness, greater skin firmness and elasticity, and even an increase in dermal thickness . Currently, resveratrol is investigated for the possibilities in acne treatment. Pilot studies have shown promising results. In a split-face study, volunteers applied resveratrol-containing gel for 60 days, resulting in more than twice reduced acne scores . It is also known to have an antimicrobial effect against Propionibacterium acnes, the bacteria responsible for this disorder . Most recently, it was discovered that resveratrol inhibits the growth of sebocytes (sebaceous gland cells), thus complementing the anti-acne activity . Although resvertarol may repair and treat sun damage (    ) it should not be used during the day as a preventative, as it is suggested that resveratrol may react negatively with the UVA in sunlight . Botanical source: Polygonum cuspidatum Sieb. 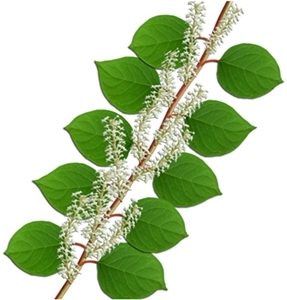 (Japanese Knotweed,Fallopia japonica, Polygonum cuspidatum, Reynoutria japonica). Mesh size: 100% through 80 mesh screen. 10% solution gives 1% Resveratrol content in final product. 31% solution gives 3% Resveratrol content in final product. 51% solution gives 5% Resveratrol content in final product. P. Farris, J. Krutmann, Y.-H. Li, D. McDaniel, and Y. Krol, “Resveratrol: a unique antioxidant offering a multi-mechanistic approach for treating aging skin,” J. Drugs Dermatol. JDD, vol. 12, no. 12, pp. 1389–1394, Dec. 2013. C. Alonso, L. Rubio, S. Touriño, M. Martí, C. Barba, F. Fernández-Campos, L. Coderch, and J. L. Parra, “Antioxidative effects and percutaneous absorption of five polyphenols,” Free Radic. Biol. Med., vol. 75, pp. 149–155, Oct. 2014. J. V. Freitas, F. S. G. Praça, M. V. L. B. Bentley, and L. R. Gaspar, “Trans-resveratrol and beta-carotene from sunscreens penetrate viable skin layers and reduce cutaneous penetration of UV-filters,” Int. J. Pharm., vol. 484, no. 1–2, pp. 131–137, Apr. 2015. C. Sticozzi, F. Cervellati, X. M. Muresan, C. Cervellati, and G. Valacchi, “Resveratrol prevents cigarette smoke-induced keratinocytes damage,” Food Funct., vol. 5, no. 9, pp. 2348–2356, Sep. 2014. J. Z. Boyer, J. Jandova, J. Janda, F. R. Vleugels, D. A. Elliott, and J. E. Sligh, “Resveratrol-sensitized UVA induced apoptosis in human keratinocytes through mitochondrial oxidative stress and pore opening,” J. Photochem. Photobiol. B, vol. 113, pp. 42–50, Aug. 2012. P. Roy, N. Kalra, S. Prasad, J. George, and Y. Shukla, “Chemopreventive potential of resveratrol in mouse skin tumors through regulation of mitochondrial and PI3K/AKT signaling pathways,” Pharm. Res., vol. 26, no. 1, pp. 211–217, Jan. 2009. M. H. Aziz, S. Reagan-Shaw, J. Wu, B. J. Longley, and N. Ahmad, “Chemoprevention of skin cancer by grape constituent resveratrol: relevance to human disease?,” FASEB J. Off. Publ. Fed. Am. Soc. Exp. Biol., vol. 19, no. 9, pp. 1193–1195, Jul. 2005. R. L. Jackson, J. S. Greiwe, and R. J. Schwen, “Ageing skin: oestrogen receptor β agonists offer an approach to change the outcome,” Exp. Dermatol., vol. 20, no. 11, pp. 879–882, Nov. 2011. J. C. Nwachukwu, S. Srinivasan, N. E. Bruno, A. A. Parent, T. S. Hughes, J. A. Pollock, O. Gjyshi, V. Cavett, J. Nowak, R. D. Garcia-Ordonez, R. Houtman, P. R. Griffin, D. J. Kojetin, J. A. Katzenellenbogen, M. D. Conkright, and K. W. Nettles, “Resveratrol modulates the inflammatory response via an estrogen receptor-signal integration network,” eLife, vol. 3, p. e02057, 2014. R. A. Newton, A. L. Cook, D. W. Roberts, J. H. Leonard, and R. A. Sturm, “Post-transcriptional regulation of melanin biosynthetic enzymes by cAMP and resveratrol in human melanocytes,” J. Invest. Dermatol., vol. 127, no. 9, pp. 2216–2227, Sep. 2007. T. H. Lee, J. O. Seo, S.-H. Baek, and S. Y. Kim, “Inhibitory Effects of Resveratrol on Melanin Synthesis in Ultraviolet B-Induced Pigmentation in Guinea Pig Skin,” Biomol. Ther., vol. 22, no. 1, pp. 35–40, Jan. 2014. J. H. Ryu, J. K. Seok, S. M. An, J. H. Baek, J. S. Koh, and Y. C. Boo, “A study of the human skin-whitening effects of resveratryl triacetate,” Arch. Dermatol. Res., vol. 307, no. 3, pp. 239–247, Apr. 2015. G. Ferzli, M. Patel, N. Phrsai, and N. Brody, “Reduction of facial redness with resveratrol added to topical product containing green tea polyphenols and caffeine,” J. Drugs Dermatol. JDD, vol. 12, no. 7, pp. 770–774, Jul. 2013. P. Farris, M. Yatskayer, N. Chen, Y. Krol, and C. Oresajo, “Evaluation of efficacy and tolerance of a nighttime topical antioxidant containing resveratrol, baicalin, and vitamin e for treatment of mild to moderately photodamaged skin,” J. Drugs Dermatol. JDD, vol. 13, no. 12, pp. 1467–1472, Dec. 2014. G. Fabbrocini, S. Staibano, G. De Rosa, V. Battimiello, N. Fardella, G. Ilardi, M. I. La Rotonda, A. Longobardi, M. Mazzella, M. Siano, F. Pastore, V. De Vita, M. L. Vecchione, and F. Ayala, “Resveratrol-containing gel for the treatment of acne vulgaris: a single-blind, vehicle-controlled, pilot study,” Am. J. Clin. Dermatol., vol. 12, no. 2, pp. 133–141, Apr. 2011. E. J. M. Taylor, Y. Yu, J. Champer, and J. Kim, “Resveratrol Demonstrates Antimicrobial Effects Against Propionibacterium acnes In Vitro,” Dermatol. Ther., vol. 4, no. 2, pp. 249–257, Dec. 2014. S. Y. Kim, M. Y. Hyun, K. C. Go, C. C. Zouboulis, and B. J. Kim, “Resveratrol exerts growth inhibitory effects on human SZ95 sebocytes through the inactivation of the PI3-K/Akt pathway,” Int. J. Mol. Med., vol. 35, no. 4, pp. 1042–1050, Apr. 2015.